Our tips on moving large items and heavy furniture by yourself, as well as how to prepare your furniture for your moving company or for commercial shipping will help ensure that your move goes off without a hitch. 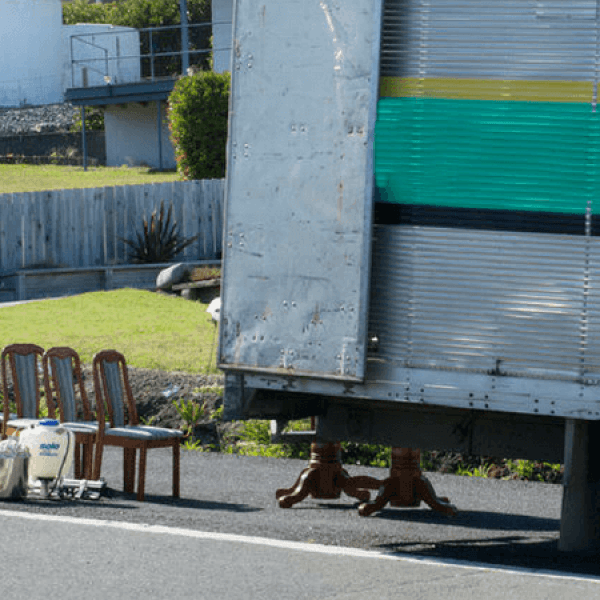 Whether you’ve rented a moving truck, hired movers, or are shipping your belongings to your new home, moving large items without damaging them (or injuring yourself) is always a challenge. Preparing yourself and your stuff for moving is the key to staying safe and preventing unnecessary damage to your belongings. Don't want to worry about the heavy lifting? Help me move my heavy furniture. Professional moving companies should be able to supply any necessary equipment such as sliders, blankets, and dollies. When you book your movers, make sure you let them know what furniture you have so they know what equipment to bring along on moving day. You should also confirm that there are no extra fees associated with using their equipment, and ensure that any fees are noted in your moving contract before you sign. Remove legs from tables, couches, and chairs. Disassemble any furniture that can be disassembled. Tape screws and other components to the furniture it came from, or place them in a bag and label it. Number and label the parts if necessary. Cover floors and banisters in cardboard or towels to protect them against damage. Wrap and pack your mattress in a mattress box before your movers arrive. Help me pack my furniture. Shipping is ideal for long distance or interstate moves, as well as for getting bulky, difficult-to-move furniture to your new home. It’s illegal to drive with an improperly secured load - if your mattress isn’t securely tied to the roof of your car, for example. Protect corners and delicate parts with bubble wrap or corrugated cardboard first, then wrap the entire piece of furniture in moving blankets. Secure the blankets with tape, ensuring that the tape doesn’t adhere directly onto any painted or polished surfaces. Consider wrapping your furniture (after it’s been wrapped in blankets, that is) in plastic wrap. In addition to keeping moving blankets in place, plastic wrap also prevents dust and grime from getting on your item. Just make sure you poke holes so that mold doesn’t form, and that the plastic doesn’t come into contact with the hard surface of your furniture - plastic wrap can damage surfaces if your furniture gets hot in transit. Cover glass surfaces with cardboard, then wrap in bubble wrap and place in a box. You can also tape a large X onto the glass in case it does break - this makes it less likely to completely shatter. Roll rugs around a PVC pipe, then wrap in plastic wrap or place into a box if you can find one that’s large enough. Learn more about shipping an area rug. If you’re shipping your mattress, place it in a plastic bag, then into a mattress box. Pad it with moving blankets for extra protection, and label the box. Need a mattress box? Order one from our supply shop. It’s way easier to slide your heavy furniture across the floor than it is to pick it up and carry it, but you’ll most likely need special sliders to ease the process. If you’re sliding your furniture over carpet, you’ll need hard plastic; if you’re sliding over tile, laminate, or hardwood flooring, look for soft padded sliders. PRO TIP: Frisbees are a good low-cost alternative, as are towels and cardboard. Just stay away from your good guest towels. Push furniture from the lower half to reduce the risk of tipping, especially with taller pieces like hutches, bookshelves, or armoires. Consider tying straps around your furniture and dragging it rather than pushing it - dragging reduces the risk of tipping and damaging furniture. Furniture straps, also known as shoulder dollies, loop over your shoulders and shift the weight to stronger muscle groups by using leverage to take the full weight of the furniture off your back. Look for straps that can be adjusted to several heights. 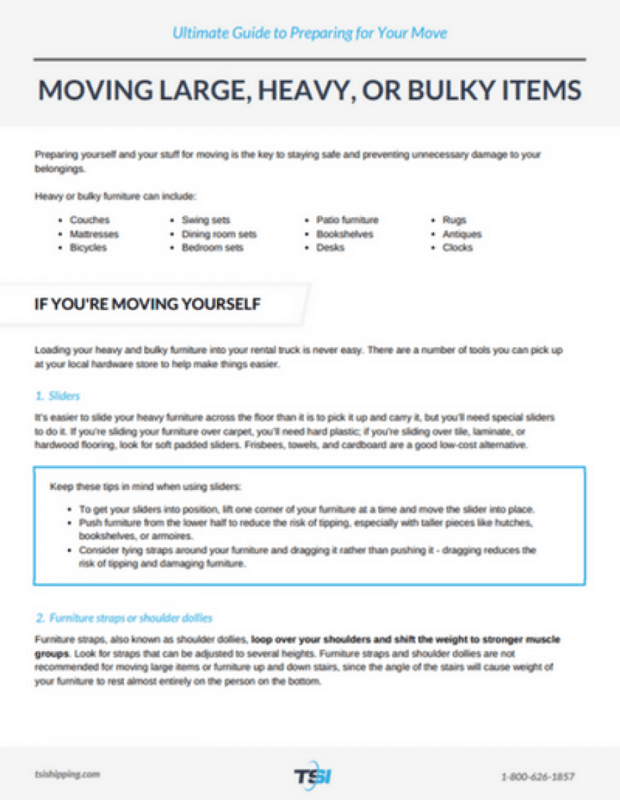 Bear in mind that furniture straps and shoulder dollies are not recommended for moving large items or furniture up and down stairs, since the angle of the stairs will cause weight of your furniture to rest almost entirely on the person on the bottom. Moving blankets are essential for protecting your furniture against damage. They’re also a good alternative to sliders; instead of being placed under the corners of your furniture, tilt your furniture if it’s safe to do so and slide one blanket under two corners, then repeat on the other side using a second blanket. 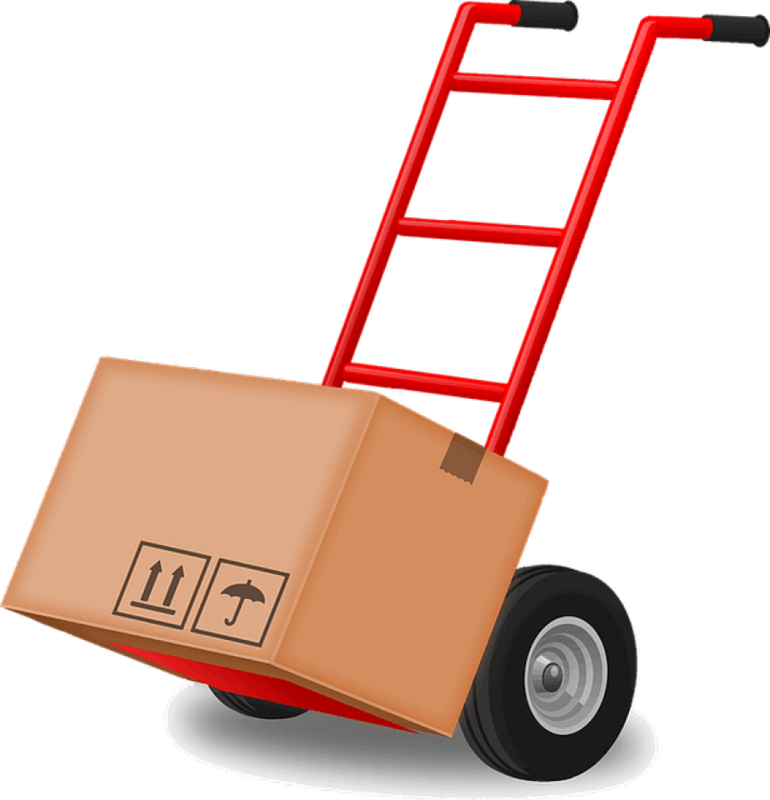 Dollies are small square platforms with four wheels, and are perfect for transporting heavy or bulky furniture or stacks of boxes. Hand trucks have two wheels and stand upright with a small platform on the bottom. They are ideal for taller furniture like bookcases or dressers, but aren’t recommended for heavy furniture since it’s only your strength keeping the furniture upright. Mattress slings are invaluable tools for moving your mattress, and they’re easy to DIY. Simply thread a rope through the mattress handles, slip some PVC pipe over the rope ends, and tie the rope to create a grip. Remove the fabric cover and place the box spring face down. Pull back the cover along each side. Cut through the frame just to the side of the center crosspiece, but don’t cut through the crosspiece itself. Do this on both sides, and in the center of the box spring. Fold the box spring like a book! To reassemble, screw a small piece of wood along the center cuts and against the inside of the frame, then staple the fabric back into place. Check out this tutorial for more detailed instructions. Use a high-low method: Tilt the furniture backwards, with one person carrying the top and another carrying the bottom. Maintain this angle as you move. The high-low method is ideal for taller pieces of furniture, and it makes traversing stairs slightly easier. Bend from the knees and hips. Use your core and your legs to lift, rather than bending from the waist and lifting from your back like the picture below Make sure you lift correctly by starting in the squat position, then using your legs to push yourself upright. Turn chairs on their side so they make an L-shape. This makes it easier to hook them around corners and fit them through doors. Take the legs off and remove drawers to make your furniture lighter and more maneuverable. You can also keep your stuff in the drawers to make unpacking easier. Protect furniture with blankets and plastic. First, wrap your stuff in blankets, then secure the blankets in place using plastic. This helps to prevent damage to the finish or any fragile edges. Empty your furniture before moving it. This makes it lighter and easier to transport. If drawers can’t be removed, secure them with tape so they don’t slide open unexpectedly. Load heavy furniture onto the truck first, then pack in your boxes. Forget heavy lifting. Find out how TSI can help move your heavy furniture.